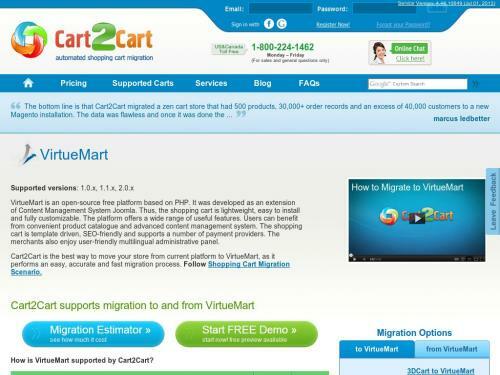 Cart2Cart is an automated shopping cart migration service. It allows store owners to migrate all products, product categories, manufacturers, customers, orders and other data from one of 45+ existing shopping carts to VirtueMart in a simple and accurate way. The process is fully automated, so a store owner don’t have to be tech savvy to perform successful migration. Since Cart2Cart is an online service, there is no need to download any software what makes the process even easier. Reasonable pricing. Cart2Cart offers flexible pricing system, which allows to pay only for entities which are really migrated. Absolutely free demo migration. Demo migration gives an opportunity to evaluate how the service works before full migration. Tech Support Team that is ready to answer any questions via phone, chat or ticket at any convenient for client time. Merchants will be able to clear current data on VirtueMart store before migration. Save orders IDs from an old store on a new VirtueMart shop. Create product variants based on the combinations of attribute values. Strip HTML from category and product names. Migrate images in product descriptions to a desirable VirtueMart store.